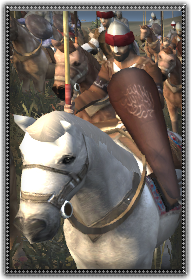 Ajnad horsemen units are built up from lesser landholders and servants of richer nobles. These light horsemen are useful to chase down foot archers or their mounted counterparts. They have to be aware of heavier foes though and a charge into a wall of spears will tear these light cavalrymen into pieces.